Consistent with CHC’s understanding that Our Lord has created each student as a unique individual, High School of Your Dreams was developed by Nancy Nicholson as an approach to high school that can be tailored to fit virtually any learning style and goal. The expanded 2015 program consists of three essential elements: the Guidebook, the Career Path E-Books, and the Course Resource E-Books. 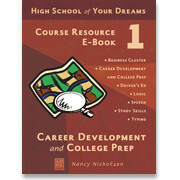 Read on to learn more about the High School of Your Dreams Course Resource E-Books. The High School of Your Dreams Course Resource E-Books provide detailed resources for developing tailored courses in over 60 core subjects and electives; select those Course Resource E-Books that include the subjects your student will study to reach his academic and career goals. Each e-book lists a variety of suggested texts for each subject, texts that can be chosen to match students’ academic levels and specific interests. Course Resource E-Books also include hands-on project ideas; possible research papers and essay prompts; experiential and volunteer activities; and other educational and career-related links to facilitate the development of an outstanding high school experience. Course Resource E-Book 5: Social Studies, U.S.
* A printed version of this e-book is included in the HSYD Guidebook. Editable forms and charts for planning, record-keeping, and production of transcript and diploma. Forms included: "From Freshman to Graduate Form," "Class Lesson Plan Form," "Monthly Hours Chart," Academic Transcript, and Diploma. Each of the forms is accompanied by completed samples to illustrate its use. On purchasing this e-book, you will be able to download two separate versions: Editable Forms and Charts E-Book 15 can be edited in Adobe Reader (version 8 or later) and saved or printed for your records; Blank Forms and Charts E-Book 15 is non-editable and can be printed off and edited by hand. Technical requirements: Editable Forms and Charts E-Book 15 must be opened in Adobe Reader version 8 or later. Other PDF viewers, including the native PDF viewer on Macintosh computers and the PDF viewers built-in to some browsers, will not allow the forms to function correctly. Adobe Reader can be downloaded for free from Adobe’s website: https://get.adobe.com/reader. Note: The Guidebook, Career Path E-Books, and Course Resource E-Books are each integral parts of High School of Your Dreams and are not meant to be used independently of each other. The first step in planning your student’s high school program is to purchase and read the Guidebook with care. Next, select two or more Career Path E-Books which best fit the student’s interests and goals. Once the student’s career goals have been prayerfully considered in light of the information in the Career Path E-Books, specific Course Resource E-Books can be chosen in order to plan the high school courses which will best prepare the student for his potential career goals. Note also that there is some repetition or similarity in certain segments of each Course Resource E-Book. This repetition ensures that, no matter which combination of e-books is chosen, the parent will have in hand the necessary information to facilitate chosen educational aims.